The eHealth Competition is an initiative that rewards the best eHealth/mHealth solutions produced by European SMEs (European Small and Medium Enterprises). Its objective is to support business success of SMEs by giving them visibility together with marketing opportunities to attract customers, partners and external capital. The EU SME eHealth Competition 2015 has the endorsement and the support of the European Commission. dacadoo, an innovator in digital health technology, announced in April 2015 that it had been nominated as only Swiss company for the in the champions category of the European Union SME eHealth Award 2015 competition, out of 114 SMEs who participated in this award. During the Final yesterday, which took place at the Kipsala International Exhibition Center in Riga during the eHealthWeek 2015, the 15 finalist SMEs had 5 minutes each to explain their solution in front of a Jury of international eHealth stakeholders and sponsors: Bruno de Olveira (European Commission), Eugene Borukhovich (SoftServe), Ming-Sun Sean Kim (XLHealth), Paul Pelsmaeker (Digitalezorg), Marko Kilk (North Estonia Medical Centre), Luc Maes (COCIR), Jordi Piera (Badalona Serveis Assistencials) and Stephen Lieber (HIMSS). 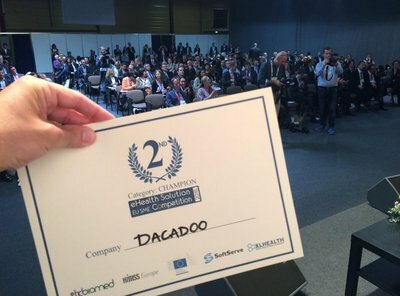 At the end, dacadoo was awarded with the second rank in the Champions category. "We’re very pleased to get this great recognition from the EU for the work we’re doing with dacadoo and we’re proud to bring home the silver medal, having being chosen out of hundreds of companies” commented Peter Ohnemus, founder and CEO of dacadoo.